Stop right there. It’s time for a paradigm shift. In other words, you want a list of the best brain-building toys in the world. Click here to watch the 2-minute video of this blog featuring all these brain-building toys! As a child, did you love playing with blocks? Today, parents rarely purchase blocks which is unfortunate because we’ve taught our kids to be users rather than creators. Buy a set of blocks for your kids and watch them have hours of fun! When I was a kid, my favorite toys were my blocks. I spent hours building and creating things with those blocks. 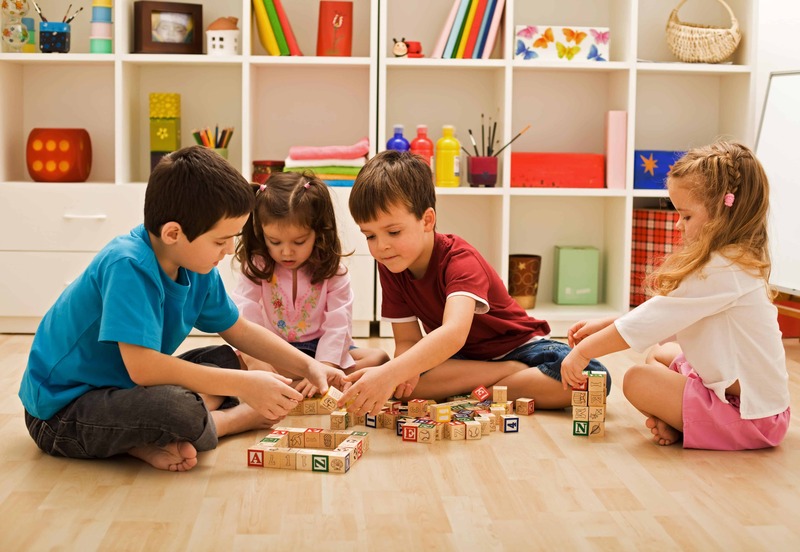 Did you know that parents rarely purchase blocks anymore for their kids? In fact, cultural critic Roland Barthes lamented in the 1970s that the wooden block’s children used to play with were in decline, and it was sad because now children were taught to be users and not creators. What were your favorite toys as a child? A toy truck? A doll? A playhouse? Toys that required interaction and movement? Share those toys with your children. Good toys, creative toys, and fun toys never age! Childhood is a time to help your children learn to express their inner-self so those creative juices will continue into their adult lives. How do you do this? Supply them with toys that nurture their creativity, stimulate their imaginations and teach them to be creators and not just users. Therefore, you want toys that prime her/his brain for learning. The toys suggested below will do just that. Also, when purchasing toys for your children, you want toys that get them moving in some way. In other words, you don’t want toys where they just stare at a screen and move their fingers. It’s funny, but the two things that help children to learn is music and movement. What two things have most schools taken out of the K-5 curriculum? So, parents—the toys you purchase for your kids should require movement. And for an added benefit, turn on some music that is zippy and bright. Purchase toys that require your kids to move. Then turn on some music while they are playing. 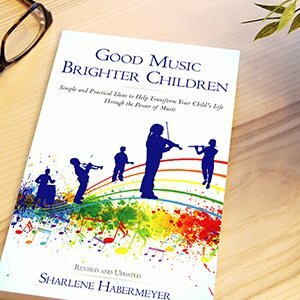 Music and movement are two important factors that help to build a child’s brain. 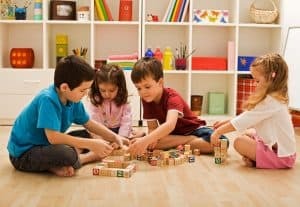 I interviewed educational therapist Alene Villaneda, owner of Integrated Learning Strategies regarding the best toys for children that will build their brains, enhance their ability to think and encourage interactive play. 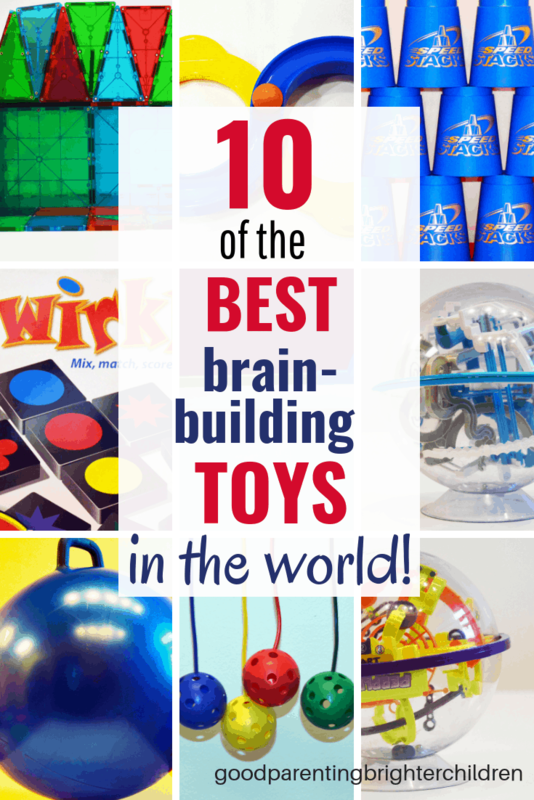 Here is a list of 10 toys and games for brain-building fun! This skipper makes a pretty cool playmate on a day when your child is alone. But it can also be played with a friend. The electronic base has 2 telescoping poles that rotate in 3 different speeds for jumping to a rhythm. The different speeds allow you to adjust the skipper to gradually go faster. Your child keeps up with the spinning poles and accompanying music by jumping in time and avoiding stepping on the poles. This operates on the same principle as an old-fashioned jump rope. As far as storage, the game folds up for easy storage. As your child jumps over the pole to a rhythm, he is basically doing brain exercises that include timing, rhythm, balance, and coordination. Keep in mind—anything that helps with timing and balance helps to organize the brain. And an organized brain is able to focus and concentrate better. Think colored PVC pipe and with a few changes (actually a lot of changes) you have Boomwhackers. Boomwhackers are eight musically tuned percussion tubes. To play, each person holds one or two of these tubes and whacks them against his arm, thigh, or any hard surface to produce a sound. The harder the surface, the brighter the sound will be. The tubes are various lengths and will produce various tones. They are available in diatonic and chromatic scales as well as treble extension, bass diatonic, pentatonic, and with octavator caps. Learning to play these percussion tubes is amazingly fun for children of all ages. They can be played individually, but it is recommended that the tubes are played as a group, which means they are great for families and classroom settings. They take some practice, but they are perfect for building a sense of rhythm and timing which in turn organizes the brain. And again, lays the foundation for a child to learn more easily. Perplexus is a plexiglass ball and inside is 22 feet worth of challenging twists, turns, and obstacles. If you think it is easy to master the challenge of the crazy, fun world of the Perplexus ball—think again. You have to flip, twist, and spin to move the ball along the numbered path. The more your child plays with it, the more they see that this game is a bendy, trendy, can’t-put- it-down challenge. Even though it is easy to fall off the track, playing with this ball is addicting and fun. There are multiple levels of difficulty to master. Try the Perplexus Rookie, Perplexus Epic, and Perplexus Twist. They’re easy to play, but hard to master. A Word to the Wise: My oldest son Jason and his wife Tiffany love playing games with their kids. They purchased the Perplexus and it was TOUGH! At one point, they considered throwing it against the wall. However, they purchased the highest level of the game instead of starting with the easiest one. So, start with the easiest Perplexus ball and avoid frustration (which means you start with Perplexus Rookie). The game helps with visual tracking which in turn helps with reading. When a child reads, they track words from left to right. This game will improve your children’s tracking ability and hence their reading. Qwirkle is a simple game of matching colors and shapes. But it also requires tactical maneuvers and well-planned strategy. You earn points by building rows and columns of blocks that share a common shape or color. And you want to be on the lookout for opportunities to score big by placing a tile that touches multiple pieces with matching attributes. The player with the most points wins! If your child is learning shapes and colors—this is fun to play. If they already know their shapes and colors, they will love the strategy involved in this game. It includes 108 wooden blocks. This is an oldie-but-goodie for good reason. The Skipper has kept up with on-the-go kids for generations and is a fun way for kids to build coordination and balance (and to burn energy). This updated version’s built-in revolution counter and six flashing LEDs kick the fun up a notch, so kids can cook up friendly competitions with themselves or other kids. It helps with coordination, timing and gross motor skills. It also helps to organize the brain which is foundational for learning. As a result, your child will be able to focus and concentrate better. If you want some one-on-one fun for your child—Infinite Loop is the answer. It’s a great toy for your child to play while you are busy, but it is also great for your child to play with when you are fixing dinner, but you still want to see and be involved with what they are doing. The idea of the game is to grip the two handles to open and close the track and have the ball run through the tracks without having the ball fall off the track. Infinite Loop is great for coordination and hand-eye movement. It also helps with visual tracking when you use the figure 8. Anything that helps with tracking is going to help your child with reading. Reading requires hand-eye movement, tracking, and coordination. If your children love Legos, they will love Magna-Tiles because they provide hours of inspiration and fun. They are magnetic and fit together in all different ways, shapes, and forms. If you are looking for something to nurture your child’s creativity, look no further. Not only are they inspirational, fun and entertaining, they are also the perfect educational toy for school-age children that will never go out of style (just like Legos). This toy kids can play by themselves or with friends and have equal the fun. Magna-Tiles are easy to construct and easy to put away for storage. Unlike most toys, each tile piece can be replaced and more tiles can always be added to build objects as big as desired. Playing with Magna-Tiles helps to build the visual/spatial areas of the brain. Because they are putting together shapes, your child will develop patterning, shape recognition, building, and fine motor skills. You want your children to be problem-solvers. As they create things with the tiles, they learn problem-solving skills that translate into brighter kids. Can Legos do the same thing? Just about. Magna-Tiles gives your child another avenue for building more intricate shape recognition and patterning. Thicker than other brands, the Hoppity Hop is the greatest and most fun way for kids to exercise without even knowing it. It is guaranteed to help your kid’s burn off that extra energy. For additional fun, try an adult size Hippity Hop to bounce along your child, after all, adults can share the fun, too. Right? This toy helps with balance and brain organization. When babies crawl, that crawling movement helps to organize the brain. The up-and-down movement of this ball also helps to organize the brain for better learning. The game develops hand-eye coordination—an important movement for reading. Sports Stacking Cups have become an international phenomenon! Parent and kids of all ages love to stack these cups at lightning speed. Your child can get hooked on these and who knows—you may want to enter into a Sports Stacking Competition. My grandkids love these and have spent hours playing with them. With a little practice, you can become pretty proficient at doing this game. Sports Stacking Cups helps with rhythm, timing, movement, and coordination. It’s a pretty amazing game that helps the child build brain cells in so many areas and translates into reading readiness, math, and problem-solving skills. Hopefully, these toy ideas will act as a springboard for your holiday shopping. Your kids will love these toys–and they will build their brains while they’re having fun. Plus, when you purchase interactive toys; toys that a child can do something different with each time they play with it–those are the toys they never grow tired of. And they are toys they want to share with their children! Here is the “Teaching Tips for Parents” section that will give you additional ideas on how to spark your child’s imagination, curiosity and sense of wonder. 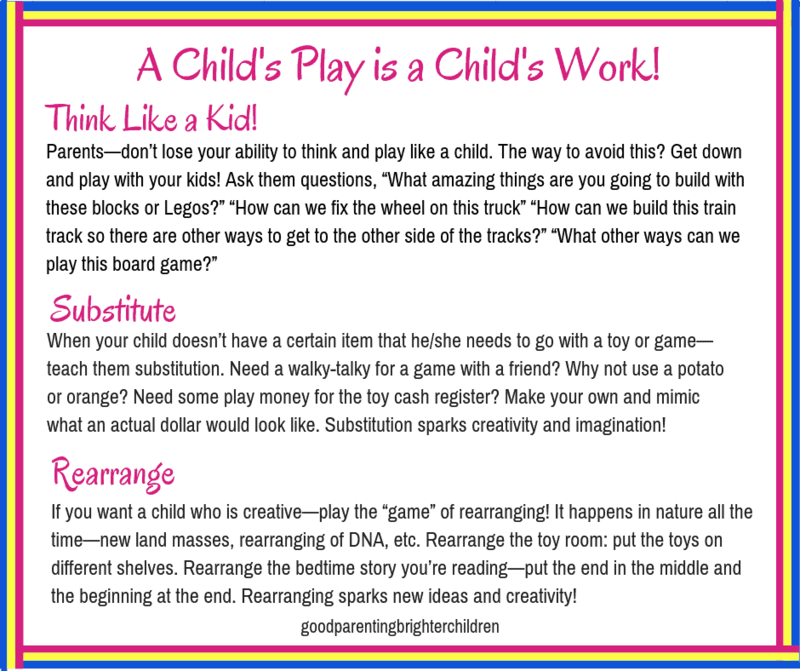 Try these ideas when playing with these toys! Want to remember this? Post these 10 Best Brain-Building Toys for Kids to Your Favorite Pinterest Board! This blog post is JUST WHAT I WAS LOOKING FOR! It was so timely. I’m planning on ordering some toys for my kids for Christmas and this really helps steer me in the right direction. Thank you for these great ideas. I’ve seen some cute homemade blocks on Etsy, and I’ve seen the magna blocks (kinda pricy) and now I have so many more to go look for. This is wonderful. Thank you Sharlene! Thanks Lindsey for taking the time to comment–appreciate it! Yes, these toys are amazing–and Golden would love the dart board–it’s velcro so it’s a successful game for kids. Watch the video on the sports stacking cups–the little boy is just over 2 years old. They are great for building the brain. Seeing these toys is finding the “child” in me again. I am going to try some of these! Okay–let me make a suggestion: try the Sports Stacking Cups–they are so much fun! That is my first choice, actually. I know my grandkids would be much faster than I could possibly be! I am looking for suggestions for a 2 1/2 year old boy with Down’s Syndrome. Okay, my friend has a DS child and these games work best: Magna Tiles: they are similar to legos only easier to work with and fit together quickly because of the magnets (good for spatial reasoning). Also, the Neon Dart game–they just have to throw the balls on the big dart board and the balls are made of velcro and stick easily (good for hand/eye coordination). Last, try boomwhackers–I would get the smallest ones, but kids just have to bang them on the floor or their body. They are tuned and make different sounds. I use them with zippy classical music playing in the background. Helps a child learn timing and rhythm which organizes the brain and helps with focusing. Hope this helps. Thanks, JoAnn–I’m impressed that you made it through all the levels–wow! Yes, the game isn’t easy but it’s great for tracking and reading-readiness (which you don’t need). Hey, thanks for sharing your experience! Do all your kids have the perplexus? These are some pretty great toys, Sharlene. I’m in search of some gift ideas for my 3-year-old nephew. He was diagnosed with Autism a couple of weeks ago. Would you recommend any of these toys on the list? Yes, they are actually amazing for kids on the autism spectrum. The Hoppity ball would be good (does he like up and down movement?). He would love the Magna-tiles–my grandkids love them and can play with them for hours. They are wonderful for brain organization. If he likes movement the Musical skipper will help with balance. Hope this helps and thank you for your comment!